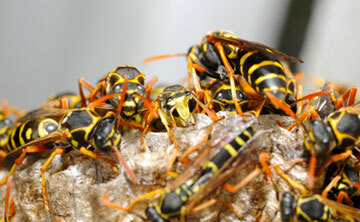 Wasp nests develop in the spring or summer months when the weather is warm. They can be found in wall cavities, behind fascia boards, in holes in the ground, in garden sheds, bushes or tree hollows and of course, in loft spaces. Establishing whether you have a wasp nest in your loft can be relatively simple: open up your loft hatch and turn the light on, then leave it for around half an hour. If you have a live nest in your loft, when you return you are likely to find wasps flying near where the light is located. Removing wasps and their nests, however, can be hazardous as it can involve working at height and is often ineffective if attempted by people who have not been trained. We offer various treatments, ensuring that they are effective by taking the nest away after the initial treatment, or if we are unable to gain access to the nest site and wasp activity is still noted, we offer a second visit free of charge. So if you discover a wasp’s nest anywhere in your home or business premises, then please call us today for a safe, fast and reliable removal service at competitive prices with a guaranteed success rate. 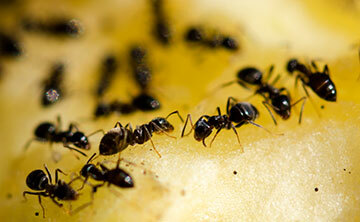 Nearly every household will, at some stage, have a problem with ants coming into their premises. A few little bits of sweet orange juice left in the bottom of a cup, or maybe some spilt sugar, and all of the sudden, you find an army of ants coming into the building. The first thing we do is follow the trail and see if we can trace it back to the nest: then we can treat it with a residual insecticide spray to the infected areas or, if it is located in a cavity, we can inject it with a dust powder.